This is where the Liquid Engineering Corporation Advantage started, more than two decades ago. Water storage tanks, towers and reservoirs of typical water distribution systems provide the critical storage necessary to meet everything from peak use period capacity to fire fighting capability. For that reason, compliance with Federal and State regulations and AWWA, NFPA and other agency standards and recommendations are an essential obligation of all water system managers. Combine these responsibilities with the health and safety accountability mandated by the Environmental Protection Agency (USEPA) and Occupational Safety and Health Association (OSHA), and system managers have effectively become compliance officers. Liquid Engineering provides totally integrated inspection, evaluation and budgeting solutions to your compliance challenges. Shift these complex problems to our team and you’ll begin to see the Liquid Engineering Advantage; everything from comprehensive Water Tank Inspections, to repair, rehabilitation, replacement and everything in between. 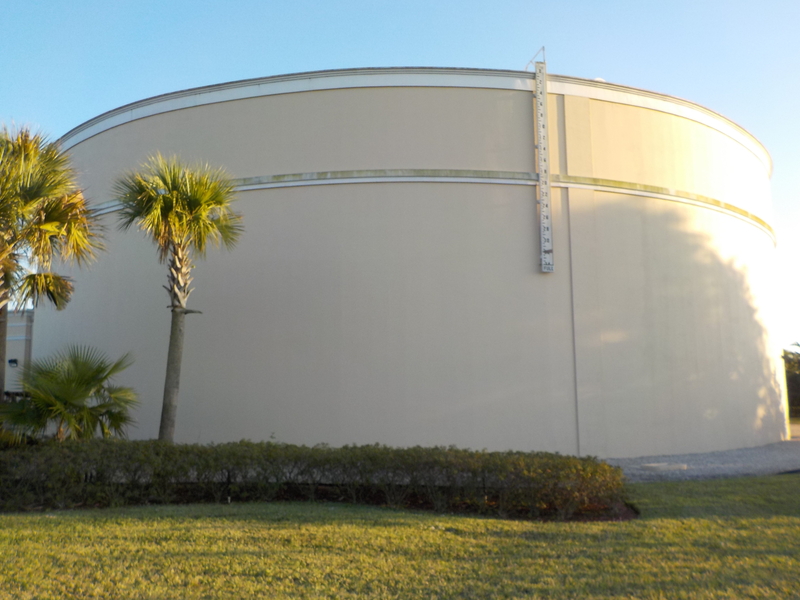 LEC’s comprehensive water tank inspections will provide you with detailed reporting based on industry standards and regulations that apply to your reservoir. Our comprehensive report will provide you with a complete analysis and assist you in maximizing the service life of your most expensive asset. LEC provides the most efficient process for removing sediment from your water tank. Your tank remains on-line and in-service during the entire cleaning process, without any adverse effects to water quality. This allows you to continually provide water to your clients during routine maintenance as well as maintain necessary fire protection storage capacity. Leak identification is easiest and most cost effective while a tank is in service. The hydrostatic pressure of the water draws the dye into the crack, which allows for quick identification. After dye testing is complete, LEC will make recommendations with respect to the repair of any identified leaks. Cracks in concrete tanks are often caused by changes in hydrostatic pressure, most commonly due to water level fluctuation or draining for routine maintenance. The location of a leak in a concrete tank can expand further once the tank is filled. Steel tank leaking is often the result of ice damage or corrosion. Repairs are best performed while the reservoir is full of water because the hydrostatic pressure actually forces the repair materials into the problem area, increasing the effectiveness of the repair. LEC routinely identifies minor areas of rusting and coating failure on epoxy coated tanks that show up even within a year of the initial coating application. Repair of these areas is crucial to getting the most out of a tank and the coating system. LEC can repair those areas with NSF approved materials while the tank remains in service. For a complete listing of LEC capabilities or to discuss a specific need please contact us.